On July 3, Egyptian armed forces ousted President Mohamed Morsi and suspended the country’s constitution following huge protests against his rule. 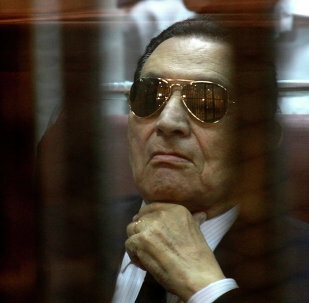 Unrelated court hearings will begin on Sunday for Egypt’s ex-president Hosni Mubarak and high-ranking officials of the Muslim Brotherhood, Egypt’s Al-Ahram newspaper said. Amid the ongoing violence that has claimed the lives of more than 750 people in Egyptian riots during the past two weeks, almost 50 Christian churches and religious buildings have been burned down. Belarusian national air carrier Belavia will suspend flights to Egypt from September as its Russian tour agency partner is no longer selling trips to the country, the carrier said on Tuesday. In escalating crackdown on supporters of ousted president Mohammed Morsi, Egypt’s interim authorities have arrested the spiritual leader of the Muslim Brotherhood, local media reported Tuesday citing security officials. About 40 percent of Russian tourists who have booked trips to Egypt say they will go ahead as planned despite the unrest in the country, though this proportion is falling every day, a Russian tour operator said Monday. Some four dozen of the Muslim Brotherhood supporters died in clashes at an Egyptian prison, media reports said citing officials. The European Union will review relations with Egypt where violence has left hundreds dead, the presidents of the European Commission and the European Council said in a joint statement on Sunday. Palestinian President Mahmoud Abbas voiced his support of the Egyptian authorities’ measures undertaken to resolve the recent conflict in the country, Palestine news and information agency WAFA reported. United Nations Secretary General Ban Ki-moon urged the conflicting sides in Egypt to shift to de-escalation and to immediately put an end to violence, his press service said on a statement. At least 60 people were killed in Egypt on Friday in clashes between supporters of ousted President Mohammed Morsi and security forces, adding to a death toll that has already exceeded 600, media reports said. 15 members of the UN Security Council gathered Thursday for closed-door consultations on the political crisis in Egypt as violence in the most populous Arab country continues to gain momentum despite attempts by the interim government to stabilize the situation. US President Barack Obama on Thursday scrapped a military exercise the United States was due to hold next month with Egypt and “strongly condemned” the violent crackdown by security forces on protesters in the Middle Eastern country, in which hundreds were killed and thousands injured. The Russian government urged its citizens Thursday to avoid traveling to Egypt, a popular tourist destination engulfed by riots over the sacking of an Islamist president that have already resulted in more than 500 deaths and the torching of churches. The United States on Wednesday strongly condemned the violent crackdown by Egypt’s military-backed government on supporters of the country’s ousted Islamist president and said it opposed the reinstitution of martial law in the country. Egypt’s interim authorities on Wednesday declared a nationwide state of emergency in the midst of clashes between police and protesters that have left almost 150 people dead in the most populous Arab nation. At least 11 people were wounded in clashes that broke out in Cairo on Tuesday between supporters and opponents of ousted President Mohammed Morsi, Al Arabiya reported. The Turkish Foreign Ministry denied earlier media reports that Turkey froze a number of agreements, which were signed with Egypt last year, the ministry said in a statement. Thousands of supporters of ousted President Mohammed Morsi marched towards military facilities in the Egyptian capital Cairo despite a warning by the army, Western media said on Monday. United Nations Secretary General Ban Ki-moon has condemned the most recent surge of violence in Egypt where at least 80 people were killed in clashes between police and protesters in the past two days. Five people were killed and 146 injured during Friday’s clashes between supporters and opponents of ousted president Mohamed Morsi in Egypt's second largest city of Alexandria, local media reported.